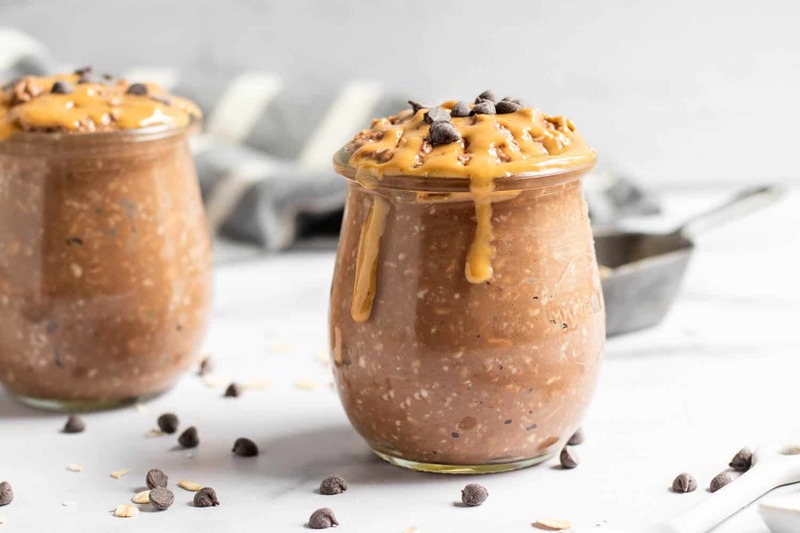 A healthy breakfast in a jar? You bet! 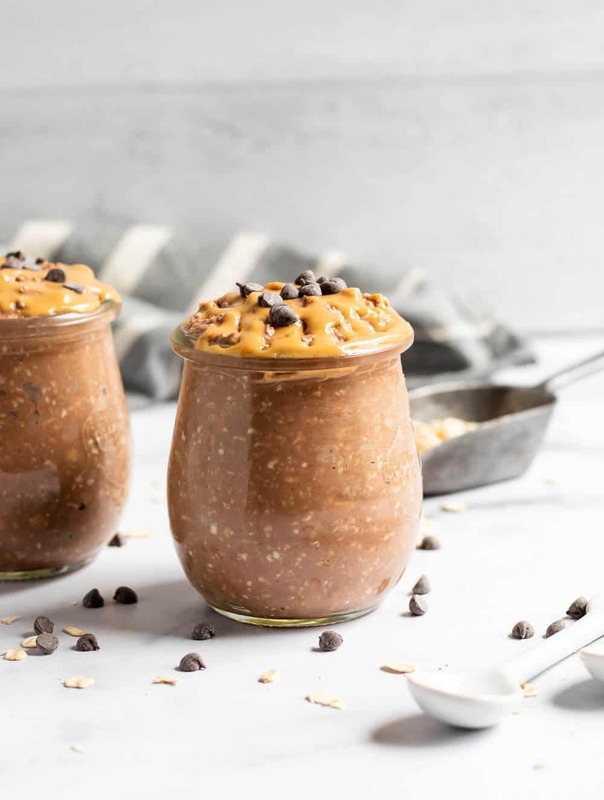 This recipe for peanut butter cup overnight oats is perfect for busy mornings. Can easily be made vegan if needed! As I mentioned in my last post, I’ve recently gone through a very rough time. Happiness and positivity have not been my strong suits and to be honest, I am not sure when they will be again. I take the good moments when I get them, and trudge through the lows as best I can. I don’t have the answers and I don’t know where to find them. I can’t stand the fact that I have zero control over the situation and can’t undo what has happened to me in any way. But life goes on. And it has, whether I like it or not. And it is not going to stop just for me. On the outside I look like the same person I was last week, last month, no one can tell the difference. The inside of me is a different story. We all have stumbling blocks that we encounter in life. Some of these falls come from our own choices and some are completely out of our control. They sting, they bruise and they shake things up in our everyday lives. They are certainly unwanted and uninvited. Once we have fallen upon them, our paths are shifted and we cannot revert back to before we fell. The true power comes from how we pick ourselves up and how we react and respond to these tumbles. After the scrapes and bruises have had time to heal a bit, how we choose to see the situation can make us or break us. Right now, the fog has not lifted completely so actually finding my stepping stones is a bit shaky. Every day that I pull myself out of bed and put one foot in front of the other, I know that I am on the road to finding this first stone or maybe even just a pebble. Each time that I choose to stop, close my eyes, and breathe, I inch myself still a bit closer. As I work to continue to nourish and take care of myself, I show that stumbling block that I am getting stronger. Soon my baby steps will feel like full strides and the fog will be less and less dense. These stepping stones will be in sight and they will lead me to the greatness that I know awaits. In times of distress, what happens to your relationship with food? Do you completely lose your appetite or do you find yourself emotionally eating? We all tend to swing one way or the other and neither is a great option. During this time of struggle I am committing to having a healthy relationship with food and continuing to nourish and strengthen myself with whole foods and clean eating. I have actually been spending even more time in the kitchen which has proven to be a positive thing for me. A year or so ago, I learned about overnight oats. Breakfast is the meal I always stick with even when I am rushing out the door. Overnight oats are the answer to anyone who has a hard time with breakfast on the run. You can easily make enough single servings for the whole week in about 10 or 15 minutes. You can eat them hot or cold, and the possibilities are endless. This week I have created several overnight oats recipes and will share them with you. Here is the first recipe! Enjoy! Refrigerate overnight. Serving options: serve with a sprinkle of cocoa nibs, dark chocolate chips, or sliced banana. I tried a batch with and without the coconut. I preferred the oats with the coconut as it gave it a touch more flavor and sweetness. If you are not a coconut fan, feel free to omit it. **Chia seeds offer protein and fiber. Some people don't care for the taste. Also, they swell up in the liquid and can often get stuck in your teeth. If you have a big meeting in the morning, you may want to skip them! ***I like to eat my warm and usually will add a splash more of milk before I heat them up or I feel the oats dry up a bit. 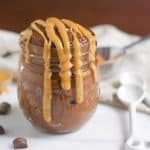 What are the macros on the peanut butter cup overnight oats? Hi Kelsey! I’m not sure what exactly denotes macros? I hear my crossfitying friends talk about it all the time! I believe what she means is what is the nutritional value of the overnight oats? Macros are the number of grams of fat, carbohydrates, and proteins. These things are best determined by the end user as they prepare the oars with their specific ingredients. You can plug it all into MyFitnessPal as you make the recipe easy enough though. Thanks Jessica! That’s what I was assuming but my friends who power lift seem to use the word so often so I figured it was out of my realm. Glad to know that app works–I’ll send others that way! The recipe sounds great! I will definitely be trying it, but your blog is what touched me. Please don’t think I’m trying to sound religious, because it isn’t about a religion that I’m talking about, but Jesus. He is the One who can heal your wounds and bring joy to your life. Happiness is circumstantial, but joy is something only He can give and it is not based on our circumstances. He can do the impossible and He is always working for our good, even when things have took a bad turn, He is reworking them for our good. The only One who can take bad things and bring something good from them. You may already know these things, I don’t know. But if you don’t I encourage you to find a bible and read about all the great promises that he has for your life. There is a God shaped hole in each of us that only He can fill. You are in my prayers. I totally agree! Without Jesus, I never would have made it through a divorce! I love Him so much! I hope you love these! They are one of my favorites. Thanks for sharing Shelly! Looks so good! Right up my alley! Lora as I was reading your post I was thinking the exact same thing Shelley mentioned. When Jesus went to the cross he took all our sins upon himself so we could walk in freedom. God is your peace, your healer , your provider, your rock, He is the great I Am. I’m not a perfect religious nut, but I am a child of the Almighty doing what He’s instructed me to me. I will be praying ✝️?? I LOVE this, had it this morning!! When I put it together last night… I had to go back to read the recipe 3x as the portion seemed small. I was wrong, very tasty & very filling!! One of the best overnight oats I’ve had. Thank you for sharing your recipe. On another note, your blog has touched me. Very powerful message & you are right, everyone has their highs & lows in life. Praying for you & your journey to making those pebbles stepping stones to healing, joy, & happiness! Oh thank you so much for the kind words! This really made my day! And so glad you enjoyed the recipe as well! This looks really yummy. I would like to try it and I would prefer it warm as well. What do you recommend for heating? I try to avoid microwave as much as possible. You could heat them up stove top for just a few minutes. That’s probably all you need. Add some extra milk if they seem to dry out a bit! I just read your post. Remember God is always . by your side . On the mountain tops as well as the valleys. God Bless You. 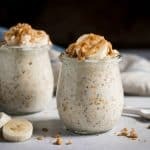 I have been doing oats in a jar for a long time and these are awesome. Tried this recipe. It’s delicious and reminds me of no bake cookies. It’s a lot thicker than I was expecting. Like actual gooey no bake cookies! Should I add more milk next time? So glad you love it! Yes, you can just add a bit more milk. Sometimes different peanut butters and Oats can just be a bit more absorbent than others! I typically add a touch more milk in the morning before I eat it! Is that peanut butter drizzled on top, how? Looks so Good! Yes! If you get the natural peanut butter (the kind you have to stir, with the oil on top) freshly stirred, it’s still pretty thin. It will drizzle perfectly! Could you tell me what is the caloric content in this? Hi! I don’t count calories, but you can easily plug in the ingredients to a calorie counting site and get them! Sorry for the inconvenience. Lorie- I am I am praying for you- that you may find peace in your soul. That God may work His way in there, and shine the light of HIs love within you. He is there. Just talk to him, and tell him all your suffering. He suffers with you, and He can heal you. Just take that leap of faith, and TRUST in Him. 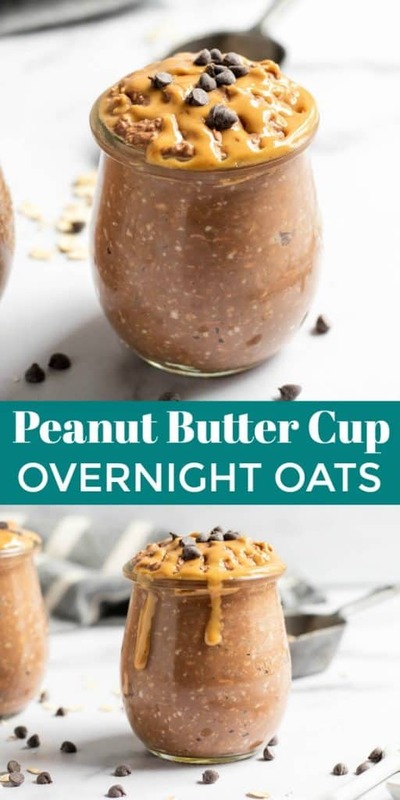 I love the “overnight oats” recipes. Such a great way to have breakfast ready and waiting. I am not a breakfast person, but if this is available in the morning, it is easy to grab and go. They are my favorite! So easy! I love overnight oats. It’s so nice to have one aspect of the morning that’s already ready for you that you don’t have to worry about when you’re getting ready for the day. Overnight oats are such a simple, healthy breakfast! The flavor of peanut butter cup would make me dash for the fridge (after coffee, of course). Oh yes, coffee first indeed!!! I have seriously been wanting to try overnight oats forever! Just recently, I started incorporating them in my morning smoothie. So good! I’m going to try this one soon! Oh yea, you will be hooked! Yea, I go on big kicks and then slow down for a bit. I’m back on it tho! Oh yea, it’s the prettiest for sure. Enjoy! I was so sorry to read about all the difficulties you were going through back when you first wrote this post, and I hope that each day has been a little better, bit by bit, ever since. Such a great quote that you shared – The most successful people see adversity not as a stumbling block, but as a stepping stone to greatness. Beautiful. And also beautiful – your fantastic photos of these overnight oats. 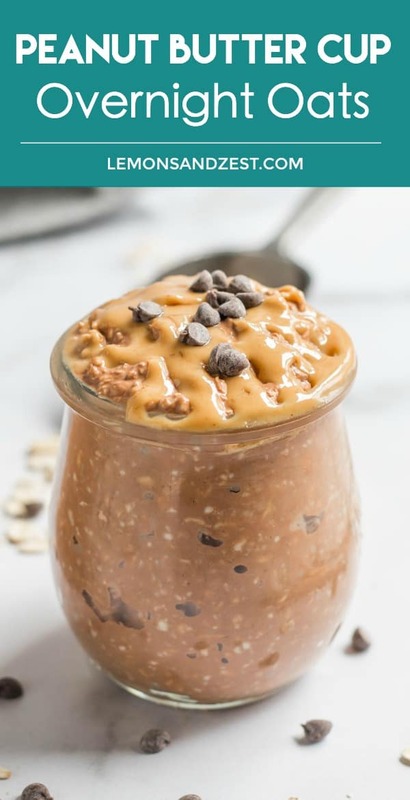 I’m a sucker for overnight oats and was so excited about finding this recipe … but for real … those pics make me just want to absolutely dive right in! Thank you for sharing both your brave and beautiful words, and also this terrific recipe. 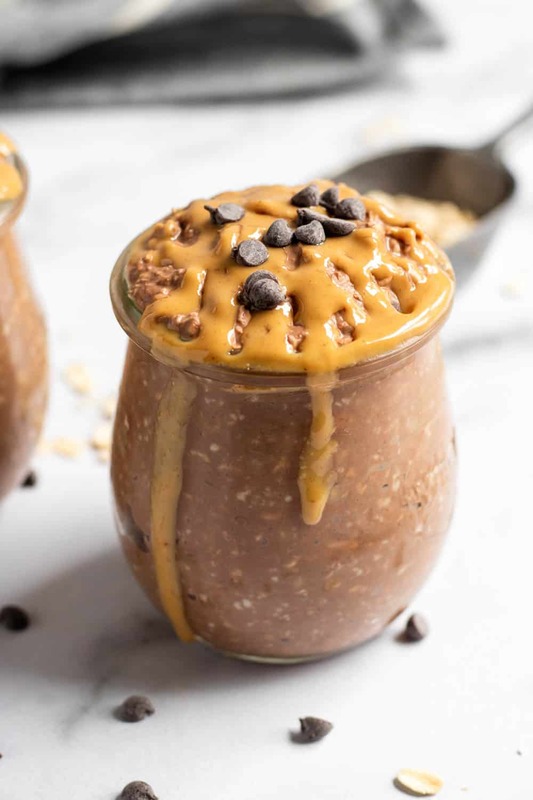 Wow this is so decadent, looks like a great post-workout breakfast, hearty yet so indulgent with lots of fiber. Practical and tasty and simple!!! 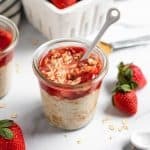 I love overnight oats, such a quick and easy breakfast option, and nutritious, too! I usually just eat brown sugar overnight oats. This looks like such a tasty option I could eat it for breakfast or dessert with a smile! Overnight oats has always been my favorite breakfast. It’s so healthy and so versatile. I love this peanut butter flavor combo. Looks very delicious and so creamy. Making this soon for sure. 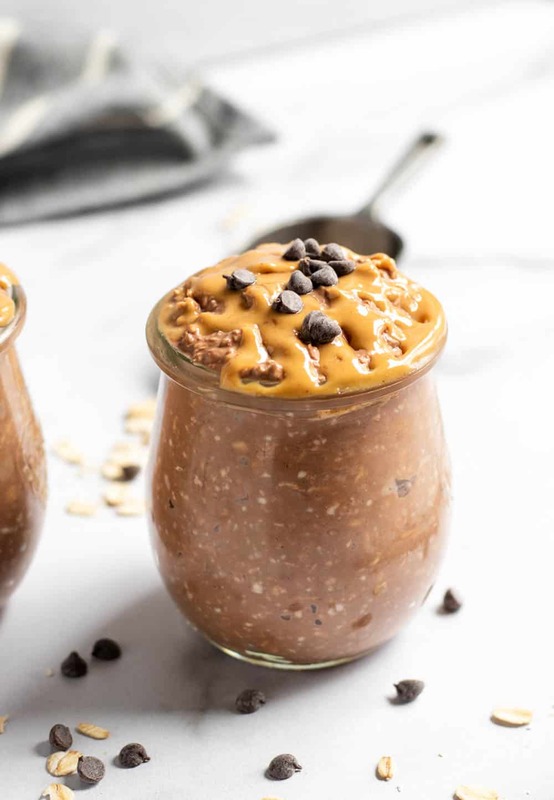 I could eat overnight oats every single day–and so many flavor combos! My wife and I tried making these. We love overnight oats. Ours turned out black though instead of the attractive brown that you made. We were wondering how to make them and get that same color and attractiveness to our oats. Oh, that doesn’t sound pretty! So some cocoas are darker which in turn can make whatever recipe turn out dark. I made brownies once with a cocoa that looked dark but I figured it was fine—the brownies were black as night!! So that’s what I assume may be the issue. 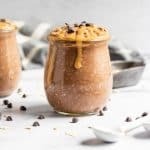 Hi I’m just starting to get into overnight oats and was wondering if I have to use the flax meal? Hi Rebekah! Flax is completely optional! The recipe will be fine without it!